Isn't that a magnificent face? The Philadelphia Museum of Art just acquired the painting. Depicting an aged man who had been born in Guinea in western Africa, taken into slavery in the American colonies and later manumitted, or freed by his owner, it is one of the very earliest known works to depict a freed slave in the United States and the earliest known painting of a Muslim in America. Upon its completion, Yarrow Mamout was exhibited at Peale’s Museum, in Independence Hall in Philadelphia, where it could be seen alongside other works by the artist and his son Rembrandt that represented George Washington, Thomas Jefferson, Benjamin Franklin, Lewis and Clark, David Rittenhouse, and many other accomplished individuals. His knit cap, serving to keep him warm during Peale’s mid-winter portrait session, may also represent headgear from the region of Africa from which he came. 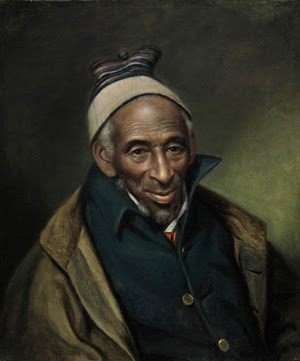 Peale’s diary describes Yarrow Mamout as a cheerful man notable for his 'industry, frugality and sobriety,' and observes: 'He professes to be a Mahometan, and is often seen and heard in the streets singing praises to God – and, conversing with him, he said man is no good unless his religion comes from his heart.'"